There is something about the long Edmonton winter. The snow lays on the ground, freezing it, making construction hard and digging up answers sometimes harder. But I like to think of it the way some farmers and other folks have talked about it with me: the earth is lying fallow, gathering energy and strength for spring. 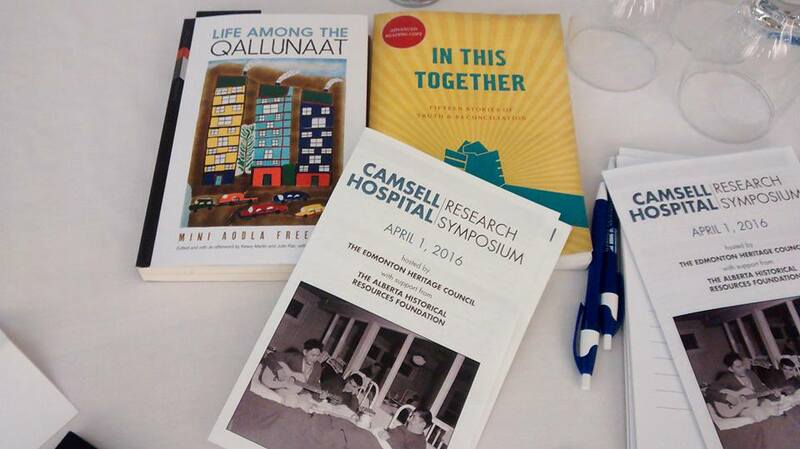 Before I left for Houston, TX in January, I madly copied anything related to the Camsell Hospital’s history at the Edmonton Archives and Provincial Archives of Alberta. I was able to save a few trees by digitally copying much of it, but I still created a veritable snowstorm of paper from any collection or fonds or newspaper I thought might have something useful. I have copied just about every single page from the Camsell Arrows and Pictorial Reviews that were put out by the hospital staff and patients over 20+ years. You can’t tell by looking at my new home office, but in that hard drive and rolling file boxes are a mountain of information. 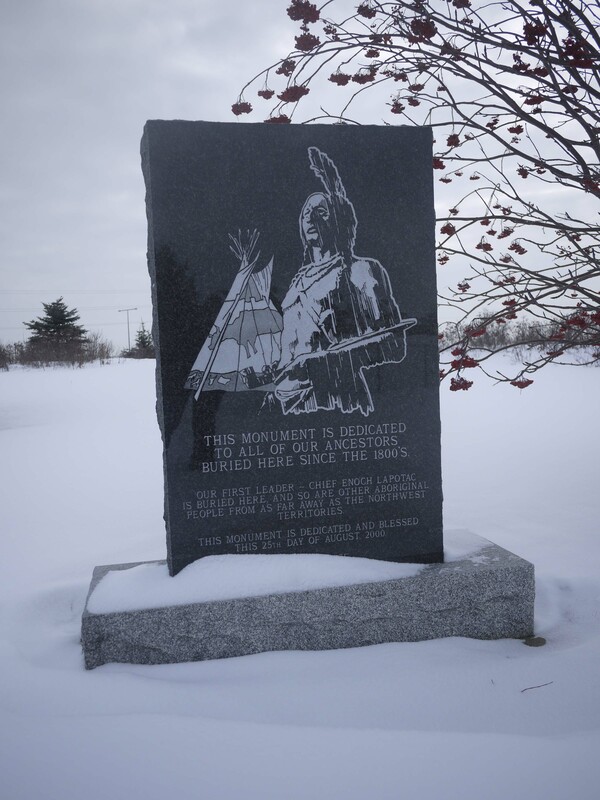 I also trudged out to Winterburn Cemetery in the deep January snow with Laura from Alberta Culture and looked for – well, anything. She had sent me some information and maps, and agreed to meet me and my rowdy three-year-old who was off from preschool that day. But beyond this lovely monument, the snow was hiding any clues as to what might lie beneath. Still, I was able to pass along that photo and much information to Cathy, Louisa and their family members, and earlier this month I was able to walk the cemetery with them. Because this is where we believe Joseph Elulik, Louisa’s father and Cathy’s grandfather, is laid to rest, along with several other Catholic patients who died at the Camsell Hospital. L-R: Louisa Baril, Dr. Sara Kormanisky, Cathy Aitoak, and me. There are still many mysteries we’re working to unravel, and a lot of work to be done to figure out the complex history and legacy of the Camsell. But there’s new energy and commitment from many quarters. On April 1, for example, an initial gathering of people representing the site’s stakeholders – patients, loved ones, staff, scholars, community organizations – took place. 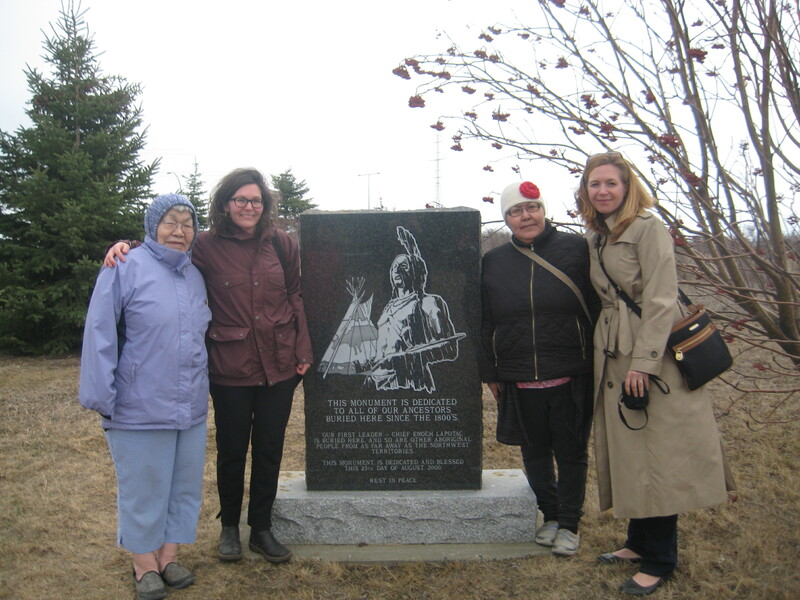 People like Cathy and Louisa traveled from as far away as Cambridge Bay, Nunavut to take part, and we all know it was just the tip of the iceberg in terms of who is connected to this site and has stories to tell. The proceedings from the symposium will be made public in a little while and I’m honoured I get to be the one to prepare the report. From there, I foresee a lot of positive movement to make sure the history is fully documented, and that individuals and communities tied to this history have a voice in communicating and commemorating that history. One of the people who attended the full day of the symposium was Gene Dub, who has just spoken publicly about his firm’s plans around the site to the Edmonton Journal. Gene addressed the crowd of about sixty at the symposium on April 1, talking about the challenges he and his investors have faced over the past decade. They have encountered costly asbestos removal work that constantly set back their budget and timeline, and have faced the ire of community members who are sick of the ‘eyesore’ in the Inglewood neighbourhood. But now with the asbestos remediation complete, they can apply for construction financing. Interestingly enough, Gene noted in his impromptu speech at the symposium that there are silver linings to the delays. For one, it has allowed him to become more familiar with the complex history of the site, something that his participation in this symposium only underlined. And as he sat in his group working through questions about history, commemoration, access to information, and more, I wonder what he was thinking. Dub said a 0.4-hectare healing garden at the Camsell site will be designed with the help of aboriginal groups and families of former patients to commemorate the hospital’s history as a federal facility to treat aboriginal people with tuberculosis and other diseases. As he noted, there are limits to what he can do on the site because of permits and so on, but it’s an idea many in the community and room agreed with. There were also a lot of nodding heads when Gene said that when the site is completely safe from asbestos, he would welcome Elders to perform a healing ceremony. The mosaic in the hallway of the Camsell by Alexander Svoboda, is being preserved during construction by Gene Dub and Associates. The graffiti will be removed and it will be restored to its 1960s-era glory. The development group hired St. Albert-based historian Michael Payne to do research into possible burial sites where the former Camsell Hospital is located. Payne apparently said there is no evidence of this and that any bodies found would likely be from the pre-1900 period from along the St. Albert Trail. They assured the City of Edmonton, however, that all work would immediately stop if a bone of any kind were found. I understand that the Provincial Government is also examining other types of evidence such as aerial photos for any clue. And I will, as always, keep my eyes and ears open. So here we are, a year after this blog began, with everyone talking about the Camsell Hospital it seems. Sharing stories and memories. Looking at its complicated history with unflinching eyes. Figuring out ways forward for healing and reconciliation. As Miranda Jimmy, the person who has walked beside me on this journey wrote on a card recently, “Out of something so dark has grown something so beautiful….” For the Camsell, it’s still spring’s tender shoots breaking through the soil. We need to keep nurturing this growth, for all of our sakes. I recently swung by the hospital and its really being turned into an apartment building. I took pictures to submit to this site for your usage but am unaware how to get them to you. Maybe you can email me?